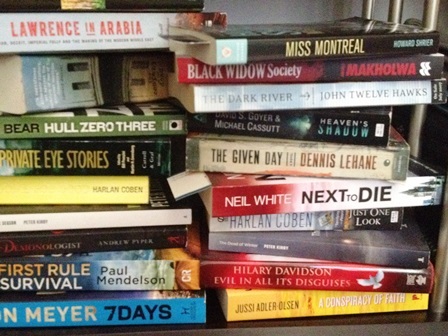 Why I had brain freeze about my favourite genre. A friend from J-school (Journalism school for those not in the know) nominated me among others, to list my 10-favourite books. As some of the nominees had already responded with some serious tomes I was feeling a bit inadequate. All righty then, the search of my database (brain) began and I was off to a decent start. I immediately came up with Lord of the Flies (William Golding) and Kite Runner (Khaled Hosseini) and after a few moments my love of sci-fi came through and out popped Isaac Asimov’s I, Robot. Okay that was three. Childhood favourite: The Velveteen Rabbit by Margery Williams. It makes me sob outright but I put it on the list anyway. For heaven’s sake where was the crime fiction? Okay, all I had to do was relax and breathe, the titles would come. Big City, Bad Blood (Sean Chercover) and Dead I May Well Be (Adrian McKinty) welled to the surface and lay there. And that was that. Even though I waited a few days I had total brain freeze, nothing else was forthcoming. Slightly humiliating for someone who reads as much as I do. Then again perhaps that’s part of the problem, I enjoy many books for various reasons but they are not necessarily stand-outs. It’s far easier for me to list favourite authors. I will drone on endlessly about authors and their books. I can tell you why I thought one worked a bit better than another in a series or how a stand-alone was a perfect showcase for a different view on an author’s talent. So ask me that question anytime. What about you? Do you have a list of favourites of any length? No favourite books as such — just favourite authors, including Honey Brown, Erica Spindler, Harlan Coben, Peter James… I could actually go for pages.